We are thrilled to welcome the month of May! The weather is great, the days are long and summer is so close, we can almost taste it! Most of all, May is the month of Golden Week, a wonderful holiday anticipated and celebrated each year in Japan. From the end of April through the first week of May, there are 5 National Holidays that we celebrate in Japan. During this week, most Japanese people have paid time off and companies will close completely. It is the longest vacation period of the year for most Japanese people, a time for rest, and great celebration! This is a popular time for local as well as international travel, and train stations and airports are often busier than ever during this week. If you don’t make plans well in advance, it can be difficult to make reservations during Golden Week. While May is a beautiful time to visit Japan, we do not recommend visiting during Golden Week. Things are very busy and crowded. Golden week ends with a bang – the final holiday of the week is called, Kodomono-hi or children’s day. It is a day to celebrate children and respect their wishes. It wasn’t until 1948 that the government declared Kodomono-hi a national holiday and insisted that we take this day to express gratitude toward children. Will you be celebrating this year? Remember the old days of homemade boxcar races? 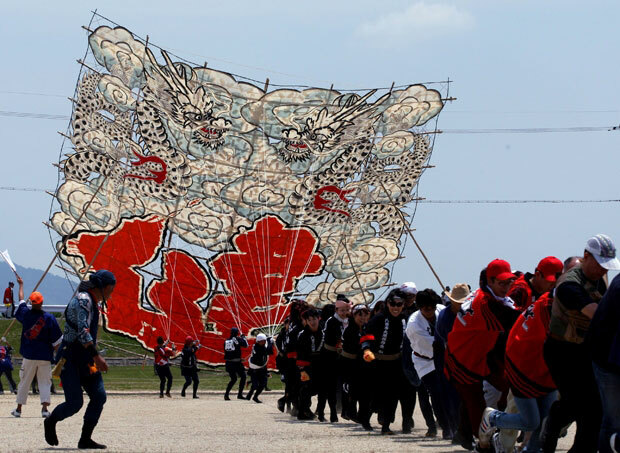 The Yokaichi Giant Kite Festival is the Japanese equivalent to a classic American boxcar race. 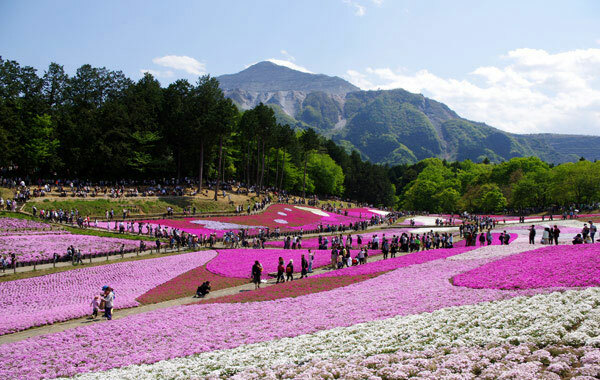 Imagine a perfectly clear spring day in Japan. The sun is shining; the bright blue sky is water colored with a few soft white clouds, there’s a band, a BBQ and kites. Giant kites! Each year on the fourth Sunday of every May, the Yokaichi Giant Kite Festival is held in Higashiomi, Shiga, Japan. It’s festival that dates all the way back to the Edo period, when new parents would fly kites for their children’s health. Today, the Kite Festival is treated as a competition between different teams. Each kite, called Oodako, is a work of art. Teams design, create and decorate their kite with local bamboo, rice paper, silk and paint. Much like you might do to your precious boxcar! The only difference is that these kites are HUGE! The smaller ones measure in at about 40 feet wide and 50 feet tall. Can you imagine handling such a thing? The competition is among teams because it takes so much manpower to get one of these things off the ground. If you get the opportunity to attend a kite festival in Japan, you will be amazed by the art, craftsmanship and teamwork filling the skies. While competitors work together to get their creations off the ground, amateurs and onlookers will experiment with smaller creations of their own. A perfect blue sky filled with color and art will be quite the spectacle for all. Kites have been around in Japan for thousands of years, but it’s only fairly recent that they have been used recreationally. Traditionally, kites were flown for religious festivals, military use and even fishing. Today, there are over 500 different kinds of kites in Japan and over 50 different kite festivals. Like most things in Japan, kite making and kite flying has become an art form. It’s also an excuse to get outside and get together with friends and family. Flying a kite of this size, or any for that matter requires focus and attention, and is always lots of fun! This spring and summer, experiment with your own kite projects. Try making your own, or just enjoy a nice day outdoors with a store bought kite. What a great way to spend an afternoon! Enjoy! 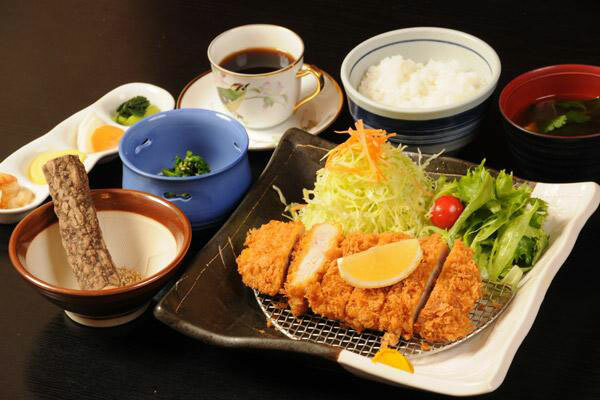 Tonkatsu is simply a pork cutlet breaded with panko and deep-fried to a rich golden brown. It’s often served over a bed of shredded cabbage with a sweet dark sauce for dipping. Most lunch sets will include rice, soup, pickles and a little slice of lemon. It’s a popular dish to grab after a long day’s work or enjoy as a working lunch. In the states, you might be able to find some version of Tonkatsu at your local Japanese market or in the form of “chicken katsu” at your neighborhood sushi joint. Better yet, you can always try making your own! There are many recipes and video tutorials for this classic dish online. We have highlighted one from The Food Network http://www.foodnetwork.com/recipes/food-network-kitchens/japanese-style-crispy-pork-recipe.html – Happy cooking! 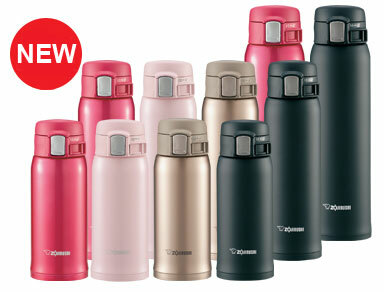 For the Zojirushi Product of The Month for May we would like to feature our Stainless Mug SM-SA. This is a great product for anyone who plans to be on the go this summer. Our proprietary technology works effortlessly to keep your cold beverages cold. Perfect for a simple way to enjoy your chilled beverages wherever you happen to be. This new product features a more compact design while maximizing the holding capacity. The lid is built with a safety lock that helps prevents accidental leaks and spills. It also comes in four stylish colors!